Reviewed by: Barbara Ardinger, Ph.D.
All shall be well, all shall be well, all manner of all things shall be well. These words of hope were written by Dame Julian of Norwich, an anchoress and the first woman to write a book in English. But we don’t know for certain who this Julian was! We don’t even know if that was her real name or if the name was given to her after her enclosure beside the Church of St. Julian’s in Norwich, England. Julian lived during the High Middle Ages. Edward III was on the throne during much of her lifetime, and she died during the reign of Henry V. She spent her entire life in the bustling port city of Norwich in Norfolk, eastern England, south of the Wash (where King John lost the crown jewels) and north of the Thames. Historian Barbara Tuchman called the 14th century “calamitous.” There were wars between England and France, peasant revolts, famines, and the Black Death. Until her enclosure around 1393 in a room beside the church, it’s likely that Julian lived an ordinary life. She probably learned housewifely skills from her mother, probably married, probably lost her children to the plague, probably tended the sick in the neighborhood and went to mass every day. Like Brother Lawrence of the Resurrection, who lived two centuries later in Louis XIV’s Paris and wrote The Practice of the Presence of God, Julian no doubt carried on an active inner life of prayer while living her outer life of service. Unlike the more famous Hildegard of Bingen (1098–1179), she probably never became a nun. It was over a century later when Martin Luther pinned his ninety-five theses to the door of the castle church of Wittenberg and launched the Reformation. 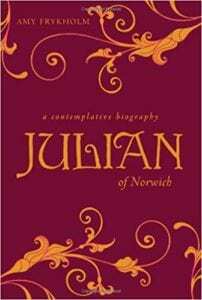 In May, 1373, Julian fell sick and nearly died. As Frykholm describes the scene, the priest came to give her last rites and held the cross before her eyes. Staring into the cross, she began hearing the words of Jesus. She came to understand the true meaning of his passion and death. When the officious priest left, an anonymous friar came to sit quietly beside her. After her recovery, she and the friar became friends and she studied theology with him. Now in the Middle Ages, women didn’t study or even talk about theology. All they were good for was to serve their masters. Englishmen who wanted to read the Bible in English were making trouble for the Roman church, and anyone suspected of heresy—especially an uppity woman—was liable to be arrested for listening to the devil. She would be burned. So Julian and the friar carried on their conversations in secret, and eventually she came to believe that her life would be more useful to her community if she withdrew from it to write down her visions. An anchoress lives alone, like a hermit, and her only opening to the world is a window with a porch for visitors. She is supported by donations and bequests. Quill says: The 21st century may well be fully as calamitous as the 14th. Let us remember and daily repeat Dame Julian’s words. All shall be well, all shall be well. Hold her words in your heart.